Wisdom is crying out in streets around the earth, stating that “she” can release an outpouring of the Spirit of God! Wisdom – not just prayer, passion, or pursuit – but wisdom claims to have a key for heaven coming to earth! What is it about wisdom that would be so powerful as to open a door to revival? 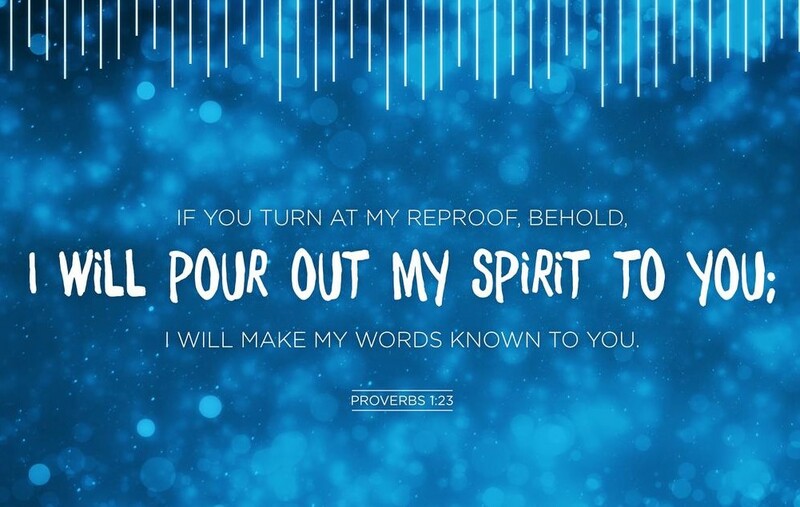 The answer lies in verse 23 – “If you turn at my reproof.” The word “reproof” means “rebuke, correction, chastisement, punishment.” Wisdom is saying that if we would turn and allow God’s discipline to have its way, God’s Spirit would be poured out on us! Isn’t this the same as repentance? Haven’t we been doing that as a nation? I would propose that though we have repented of national sins and asked forgiveness for past wrongs, we have yet to fully embrace God’s discipline and correction as believers in our ongoing journey. It’s not only our past that He wants to transform, but our present condition, as well. One of the biggest strongholds in our nation that is being displayed on screens around the world is that of rebellion against authority. It is the unwillingness to be corrected, challenged, rebuked, or disciplined. Unfortunately, this has also crept into the Church. Due to past hurts from authority figures and corporate offenses against various denominations or churches, many have alienated themselves from the Body, and become convinced that any correction or rebuke is either religious, abusive, or controlling. This has resulted in a belief system that shuts out wisdom’s lessons due to fear and rejection. Could this be why some of our prayers for this global outpouring are yet unanswered? Are our own painful experiences blinding us to wisdom’s work of correction and discipline? Scripture teaches us that God disciplines those He loves (Prv 3:11-12; Heb 12:7-11). He rebukes, corrects, and chastises us so that we will become holy, even as He is holy. This is the path to the center of His heart. I believe that the love of the Father is so strong, He will do anything to see that we become fully mature, built up and perfected (Heb 5:8-9). And, He will often use others in the process to guide, counsel, and…yes…correct. Ask the Lord to reveal any hint of rebellion in your own heart due to past hurts or misunderstandings (1 Sm 15:23; Ps 129:33). Forgive those who have hurt you and release any offense, personal or corporate (Mt 18:34). Repent for any criticism, accusation, or bitterness towards those in authority and determine to bless them and pray for them (Rom 13:2; Mt 6:14). Determine to receive wisdom’s correction and discipline through those whom God places in your life (1 Pt 5:5; Ti 3:1). Habakkuk 2:14 says that the earth will be filled with the knowledge of the glory of the Lord as the waters cover the sea. His glorious presence is already being seen and demonstrated in many parts of the earth. But, it is His knowledge (wisdom) that is yet to be fully demonstrated through His sons and daughters. Let’s pray that we can listen to wisdom and embrace those needed corrections so that God’s Spirit can be poured out in fullness. i would say, “Ditto” to Carole’s comment. I Corinthians 13:5 (NASB) says that love “does not take into account a suffered wrong” or (KJV) “thinketh no evil.” Yet, too often, we as Christians have taken offense when criticized or corrected. As with many of the things you write and spoke while in DC for NDP, i have adopted this as part of my conversations with the LORD as i desire to cooperate with the “convicting” work of Holy Spirit in my life to eliminate those things which i can too easily see as a weakness in someone else’s life and fail to see in my own. BLESS YOU, Dear Wanda and thank you. Thank you so very much Wanda! this is such a timely word.! Blessings for your Faithfulness to declare HIS HEART!